We offer corporate care for businesses, and provide rapid access to effective care for your employees. If you’re a business owner or employee assistance programme (EAP) seeking musculoskeletal and chiropractic services, please contact us. We will be happy to discuss joining your network. This resulted in cost savings of £33 per individual in direct health costs, and £400 per individual in societal costs. 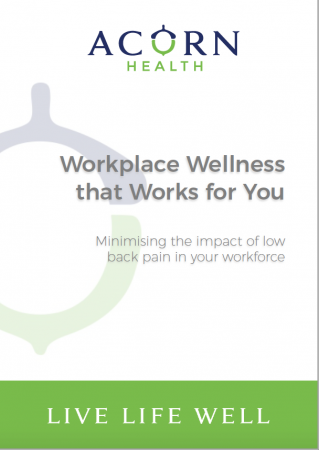 Find out more about our Workplace Wellness programme offering award-winning chiropractic care for your company. In addition, further services for employee and corporate care and wellness are also available at Acorn Health. Small to medium businesses can benefit from a tailored solution for their team. We would be delighted to prepare a programme which meets your business needs. Please download our Workplace Wellness programme or contact us using the form below. View the NICE guidelines for low back pain and sciatica here.